« To Scrap or not to Scrap…..that is the question! Our daughter, Aedita, has quite a story to tell. I’m not here to give you her story. You can read it for yourself at https://croniclesofagingerbreadman.wordpress.com. So last year when she announced to us that she was running her first half marathon on the Sunshine Coast we were not that surprised. It takes a lot of courage to run a half marathon (not to mention all that training etc). 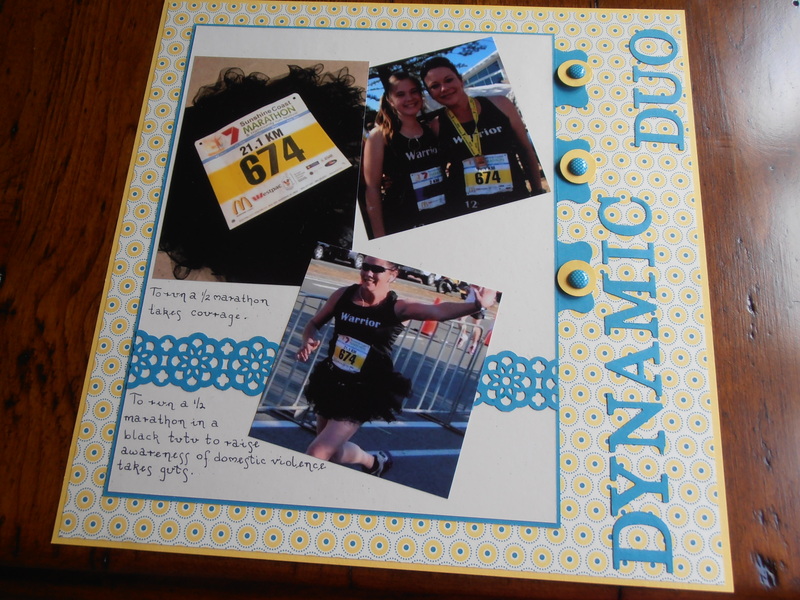 However, to run that half marathon in a black tutu to raise awareness to domestic violence takes sheer guts. Then her daughter, our precious granddaughter, also decided to take part and ran the 2 ks. We were ever so proud of both of them. The photos are once again fairly dodgy ones, but the occasion needs to be recorded. Creating with SU is so easy. Notice how all those elements match perfectly. Cardstock, DSP, Brads all co ordinate beautifully.